Yet appearances can be deceiving. Somebody is trying to kill government liaison Reiko Gotoh, but her lycanthrope bodyguard, Seiji Hama, is nowhere to be found. The mystery of Hama’s whereabouts can only be solved by examining the past, when the ill-fated couple first met. The past may be the key to saving Gotoh in the present—and to the future of the Vampire Bund itself! The all-new sequel to New York Times Bestseller Dance in the Vampire Bund starts here! 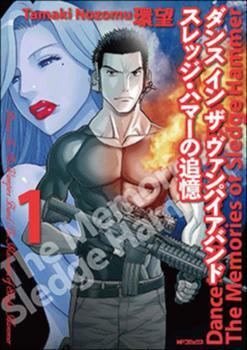 Dance in the Vampire Bund: The Memories of Sledge Hammer is a two-volume interlude between Dance in the Vampire Bund’s first fourteen volume story arc and the upcoming second part of the series, which will launch in 2014. The Memories of Sledge Hammer delves into the past to look at the doomed love affair of one of the Vampire Bund’s most deadly operatives.